Turn Instagram followers into email subscribers by offering a good gift in exchange for an email with a link in your bio. Email subscribers are great for getting repeat visitors to your store/product/service, more engagement and comments on blog posts, videos, and other content. If it’s possible for your business, use user generated content. Check out GoPro on Instagram for a great example. User generated content is more interesting, authentic, and relatable. And gets more likes! Interspersed staged photos with candid and “behind the scenes” photos and captions. You’ll notice that commenters love candid, raw, and authentic posts. Follow Devesh at Deveshdesign.com or on Twitter @deveshkhanal. Have a strategy, a plan or a guideline for what you will post on Instagram. People are making judgements about you, so make sure that your pictures are a reflection of your brand. What do you want to communicate about your business in pictures? Focus on communicating the personality and experience of your business. It really helps to have a structured marketing message that clearly communicates what you stand for. Once you have that outlined, what you share can support that message. If you are a CPA that specializes in taxes, you can post all the different things that are deductible. My hairstylist specializes in color, so she’s always posting images of clients and styles in interesting colors to feature her talent. Get appropriately personal. Don’t be afraid to share images of you with your dog and family. People make buying decisions based on who you are. Show them. Follow Ivana at Diymarketers.com or on Twitter @DIYMarketers. Making your images stand out, because images are what draw peoples’ attention. Follow Dave at Ninjaoutreach.com or on Twitter @ninjaoutreach. Well the very first thing is to have an awesome Instagram account – because naturally people you engage with will check out who you are and what you’ve done and what your taste is with photography in general. Next, keep on engaging people who you want to follow you – give them your attention, leave some comments and give them some likes for crying out loud! If they give you a follow, ask them what you could do for them to help them out in their Instagram reach – you’re a social media specialist after all! Give value so you could ask them for value in return someday – if they’re grateful. At the beginning it’s best to look for your “real friends” and people that are interested in your lifestyle because they will interact with you more naturally. Promote your Instagram profile in other social networks! On Facebook, your shared pictures will appear directly on your wall with its title and the link to the Instagram feed. Twitter posts a shortened URL with a direct link to the Instagram webpage. Commenting on your profile, answering the questions your followers might have, giving advice and talking about your interests are ways to give your profile a breath of fresh air and dynamism. Follow Phil Gonzalez at Instagramers.com or on Twitter @philgonzalez. Share something unusual – This could be something you have discovered (another cool Instagram account) or an inspiring quote to make people really think. Follow Holly at Pixc.com or on Twitter @pixcphotos. Remember that it’s not about you, it’s about them, the viewers. If you have to think more than three seconds about whether something is worth posting, it’s not. Follow Erick at Socialnomics.net or on Twitter @equalman. Decide your focus topic, create a strategy, with a clear list of people to follow and engage with them for 3 months; Make a clear list of people, 100 people, 1000… Push a clear strategy, with focus, brand focus and regularity. After that create good images and start engagement, like their photos, follow them, comment and give them engagement, attention. Look at the hastags more relevant for your focus and use them regularly. Hashags are critical for Instagram and its success. So manage them and play wise to the algorithms and the areas that you want to touch. Things to keep in mind according to Instagram rules:When people with private profiles tag posts, they won’t appear publicly on hashtag pages. Numbers are allowed in hashtags. However, spaces and special characters, like $ or %, won’t work. You can only tag your own posts. You can’t tag other people’s photos/videos. You can use up to 30 tags on a post. If you include more than 30 tags on a single photo/video, your comment won’t post. Clear Calls to ActionOn Instagram, calls to action appear either in the image itself or the caption and create engagement. They are critical to push relations and manage the growth.To find success on social media and special in Instagram build a community, even if for 50 people, 100, and commit to creating and sharing a message and images that are interesting and relevant. Special engage with other like-minded accounts with the same interests and passions so you can propel each other to success. Use and manage Location for Calls to ActionLocation is key in a geolocated world and with algorithms is the only ways to get more engagement and growth. Since Instagram only allows advertisers to share a clickable link in their posts, adding text to location is a great work around to highlight a call to action. Follow Dinis at Intelligenthq.com or on Twitter @intelligenthq. Regramming other photos – making other people the star grabs their attention and is a quick and easy way to get great content for your account. Run a contest – many businesses have seen huge success with simple Instagram contests. Simply promote the contest and a hashtag. Build community – you get out what you put in. The more you interact with other users the more they will interact with you. Follow Krista at Bootcampdigital.com or on Twitter @bootcampdigital. My tips would be to use relevant hashtags – look to see what it is trending and post content if appropriate that fits within that, put your hashtags in the 1st comment not your caption to not look spammy and periodically ask people to tag others in their comments – this brings new people to your Instagram. Follow Katie at Katielance.com or on Twitter @katielance or on Instagram @Katielance. I enjoy mixing business and work on my Instagram. I’ll post something at one of my speeches or at a surf spot. That humanizes a person and adds to engagement. Commenting on others’ photos and posting photos of others with a mention of their Twitter ID are both ways to engage with people beyond your own feed. Follow David at Davidmeermanscott.com or on Twitter @dmscott. Know your audience. Know what your audience and ideal customer wants. Know what inspires them, empowers them and helps them solve problems. Researching hashtags. Know what hashtags your audience and ideal customer is using and searching for when finding, reviewing and curating content. Provide value. Don’t spam links or silly quotes constantly. If you provide value, and are human, authentic and transparent on Instagram it will help you build relationships, establish and earn trust and authority. Be patient. Trust is not build overnight, it must be earned. Follow Pam at Pammarketingnut.com or on Twitter @pammktgnut or on Instagram @pammktgnut. Ask your followers to tag someone else in the picture. Follow Mike at Seosite.ca or on Twitter @seosite_ca. BE authentic, show them behind the scenes that no one else gets to see. Use #Hashtags that are focused on your primary industry and expertise. People review these daily! Work to get yourself in InstaGram’s ‘featured hashtag/photo’ for the day and you’ll add hundreds of new followers per week. Follow Sandi at Arealchange.com or on Twitter @sandikrakowski or on Instagram @sandikrakowski. Write an interesting caption, mention and tag related people. Follow Leye at Intense.ng or on Twitter @intenseng. Create quality content. If your business offers a product or service create content that reflects your brand and offers the community value. Too often we see Instagram accounts losing followers purely because their content doesn’t add value. Do you really want to increase engagement on Instagram? Engage! It’s that simple. You want more Likes and Comments, you need to do the same. You get what you give. Follow other accounts of interest, like and comment on their posts and before long you will see and increase in engagement. Compelling Bio. So many brands and business accounts on Instagram have either not bothered completing their Bio or have a less than desirable Bio. Make sure your Bio is first, reflective of your business or brand. Then make is interesting or fun! When a potential”new follower” looks at your Bio you want them to hit the”Follow” button. Follow Sergio at 2sonsmarketing.com or on Twitter @2sonsmarketing or on Instagram @2sonsmarketing. Share stories and post behind-the-scenes picturesBrands that only post about their products will not meet consumers’ expectations on social media. The key to succeed on Instagram is to share a story. A product is never just a product. Every brand has a story and should be able to tell it to their customers. Instead of focusing on your products only, we should share the stories behind the company. This type of content conveys a lot of emotions and portrays the brand in a personal context. Besides, it’s important to give your followers an insider look at what you do. Showing how your products are made reassure consumers about their quality. It gives followers the feeling of being let inside the loop. It strengthen trust they have for your brand. Regram your customers’ picturesThe use of the”regram” technique, which consists of posting and crediting another user’s relevant image on your own Instagram feed, will allow you to interact with your customers and to add a”personal touch” to your feed. You can entice your customers to share pictures of your brand with a campaign-related hashtag, or you can select the “fan of the month” picture to let your brand ambassador know he is appreciated. Not only are your customers excited to see their picture posted on the official feed of the brand but it also makes the brand’s content stronger. This is also a good opportunity to get closer to your followers. Engage with your communityAnother tip to help you master Instagram is engaging with your community. You can start with making your followers feel that what they think matter to your company. It’s vital to not only listen to your followers but also reply to their comments. Using hashtags related to your business industry will help you find people who share the same interests. Liking their pictures and interacting with them is a the best way to recruit new people! Post creative, fun, fresh, and interactive Instagram content and keep it align with what your brand should embody! Follow Brent at Outsmartlabs.com or on Twitter @Outsmartlabs or on Instagram @Outsmartlabs. Engage with people with the same interest as yours & Make sure to comment & reply on people’s pictures. Incentivize people to do specific actions with call-to-actions. Tagging a friend strategies are always very effective at engaging with an audience. Follow David at Outsmartlabs.com or on Twitter @Outsmartlabs or on Instagram @Outsmartlabs. Never spray and pray – Don’t just post a ton of images and set your account on cruise control hopping that your pics are somehow more amazing than everyone else’s. Always respond and stay tuned in – If you want engagement, you need to be engaging. Sounds simple but it baffles me how so many people have these one sided feeds and are clanging bells. Instagram is not Facebook – Even though these two are interwoven, they are separate networks. Take time to tweak the two and make them unique from each other. Follow Jason at Ontracktips.com or on Twitter @OnTrackTips. Follow Massplanner at Massplanner.com or on Twitter @MassPlanner. Consistent and timely posts to your account that frames and supports your unique Instagram personality. This grants followers access your, otherwise hidden, experience of timely events providing value they cannot find via another channel. Consider having an Instagram specific promotion that requires engagement with your brand to be considered such as @ mentioning your account when posting from their own profile. Highlight followers on your account by re-posting their posts where you were mentioned. Follow Jonathan at 3qdigital.com or on Twitter @3qdigital. Don’t over edit your pictures. Online shoppers look for authentic images that reveal the most honest looks and features of the products, so try to keep it simple and relatable. Post Behind the scene photos from your business. Daily BTS snapshots add a human nature side to your company, create a friendly look with customers and thus make people more likely to trust and do business with you. Don’t forget a call to action in every post: a question, survey poll, you name it. If possible, give your followers some kind of incentives to encourage them to take the action. Follow Zoe at Beeketing.com or on Twitter @beeketing. The best way to see more engagement on Instagram is the same as any other Social network and that is to be present and engage yourself in the right place. First start off by identifying 20 or so individuals that have an Instagram following you’d like to have. Make sure that you not only engage with every one of those individuals posts, but that you also engage when appropriate with those who are engaging with those people. The more you do this frequently you’ll not only build your own relevant / targeted following, but you’ll also begin to see more engagement on your posts. Next identify the hashtags that your avatar (ideal customer) are using and spend some time searching that hashtag and favoriting when sincere posts by individuals using that hashtag. This will also build you a large relevant following as a portion of those will follow you if they find your posts interesting. You can do this on Instagram or utilize a tool like Iconosquare. 3. Lastly and most importantly make sure that you have a trackable link in your profile by using a tool like Bit.ly. Remember what doesn’t get measured in marketing doesn’t grow. Watch to see each week, does your actions result in more clicks, increases in followers, comments and so on. Compare week over week and double down on what is working and end what isn’t. Follow Michael at Socialquant.net or on Twitter @thesocialquant. Appeal to emotions: both your image and copy should be your chance to appeal to your followers’ emotions (desire, hope, pride, empathy or even fear!). Also, inserting a few relevant emoji in the copy will help draw attention to your post. 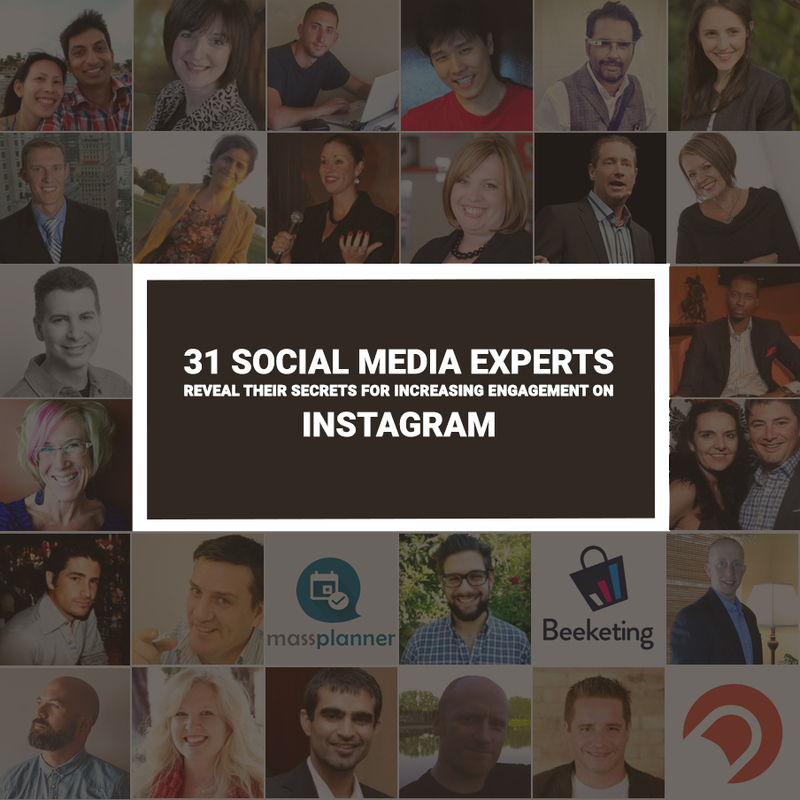 Engage with other Instagrammers: if you want people to engage with you, then start engaging with others yourself. Like, comment and share photos from other Instagrammers. Tag or mention them in your regards, to make sure they see it. Follow Geoff at Wersm.com or on Twitter @wersm or on Instagram @wersm. If you want to engage, you’ve got to create an opening for your followers. You can do this by choosing visual content and messaging that is a shared experience, something that they relate to, aspire to or have knowledge about, and then invite their feedback and comments. Inviting followers “behind the velvet rope” is also a way to increase engagement – showing them something privileged, secret or previously unseen/unshared. Hashtags are very helpful, when used in a thoughtful and targeted fashion. While trending/popular hashtags can possibly get more views, for engagement it’s best to seek out niche hashtags that really tell your story and help seekers find your content. Be specific, and think in terms of newsy tags that searchers might search with: who, what, where, when, how, & why. For brands in particular (but also for individuals) it’s a good idea to hone your visual voice. 3. Color in particular is the most elemental way to define your visual voice. Color is understandable at a glance and Hashtracking data really reflects the impact of color on Instagram image engagement. The most commented and liked posts are very often the most “disruptive” and unexpected colors in the bunch – for example a photo of a flaming orange sunset in the midst of a stream of #Caribbean #Beach shots, rife with clear turquoise waters. Follow Ciaran at Hashtracking.com or on Twitter @Hashtracking. Be consistent with your plan. Consistency is what separates great marketers from average ones. Follow Ali Mirza at Isocialyou.com or on Twitter @alimirza2k or on Instagram @alimirza2k. People do business with people so make it personal. Your followers will want to get to know the person behind the business so give them an occasional look at who you are. Find a balance that works for you. Branding is very important so brand as many of your photos as possible. It’s really easy to do but requires a little work in advance. Use Canva.com to add your logo and some text too if you want to. Always be using social media to build and drive traffic to your own digital property. Link your photos and videos to a free resource on your website, or a signup page on your site to build your email list. Follow Larry at Larrygmaguire.com or on Twitter @larrygmaguire. Use high quality images. Taking the extra time to create beautiful images will go a long way to being noticed and creating engagement. Comment. Being a part of the community rather than just broadcasting on the community is critical. Reply to comments on your own content, taking the time to write thoughtful and unique replies will make others want to connect (and stay connected with you). Follow and engage with your target audience. You can promote through a Custom Audience or Look Alike audience using the Facebook Business Manager, once you start to gain those engagements, go back to #2 and foster those relationships both by replying and reaching out to their channels and starting real conversations there. Follow Dan at Honeypotmarketing.com or on Twitter @honeypot_mkting. Have and maintain a theme: This is the best way to attract a loyal, engaged following. Be consistent: It may be tedious, may not give you immediate results. However, posting consistently is the best, probably the only, way to get consistent engagement. Ask for engagement: The easiest way to get more engagement. Ask for likes and/or comments clearly in your captions and see them come in. Bonus tip: Write long captions. Trust me, they’ll work. Examples: @Instagram and @natgeo. Follow Nischal Shetty at Crowdfireapp.com or on Twitter @crowdfire or on Instagram @crowdfire. You Scratch My Back, I’ll Scratch Yours: double-tap, engage on and share your followers posts. They will reciprocate. @Mention Me, Don’t Leave Me Hanging: speak directly with your followers and always respond to them. A large fraction of engagement is on you, talk and get acquainted with your audience. Follow Irfan at Digitalinformationworld.com or on Twitter @digitaliworld. Run contests: Contests are the quickest method you can use to increase Instagram engagement. To take part in the contest you can ask people to perform an activity such as ‘Liking’ a photo or commenting on it. This will boost engagement instantly. Use only relevant hashtags: Using 4 to 5 hashtags in your Instagram posts can increase engagement. Some people know this and add them to their post, but they do it randomly. Instead of doing this they should use a website or tool like Top Hashtags to find the most relevant and popular hashtags and only use them. This will get your target audience to interact with your post. Get a good Instagram analytics tool: Every Instagram account will have a unique set of followers. It is necessary for you to experiment with different kinds of photos and find out which ones your followers like to engage with most. Good analytics tools like Social Bakers, Quintly and Simply Measured can help you measure which photos get the best results. So make sure you invest in one. Follow Mitt at Socialmarketingwriting.com or on Twitter @SMWriting.